Netra B. Chhetri has been in the forefront of advancing innovative approaches to climate adaptation that tie together and link multi-scalar processes between environmental dynamics and social outcomes. Working at the complex intersections of climate change adaptation, food security, resource governance, grassroots innovation, and public engagement Professor Chhetri's skill set allows him to span the boundary of knowledge and practice, so that each reinforces the other. As a scholar, Professor Chhetri's efforts to develop a method for assessing the multiple sources of environmental impacts on society is unique and an important tool for designing and prioritizing climate adaptation strategies. As a practitioner, he has more than a decade of experience working at the complex intersection of science and policy and developing most promising solutions that focus on scalability, impact, and sustainability. 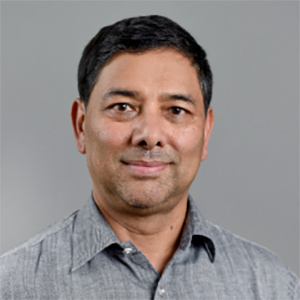 Professor Chhetri's expertise in global food security has evolved to focus on the impacts of climate change on global food systems, leading him to be one of the contributing authors to the Fourth (2007) and Fifth (2014) Assessment Reports of the United Nations Intergovernmental Panel on Climate Change (IPCC). His work appears in numerous prestigious and peer-reviewed publications including Nature and the Journal of the National Academy of the Sciences. He is also a part of a team exploring how biofuel crops such as perennial grasses can be grown sustainably in the United States. Professor Chhetri regularly teaches courses: Global Change, Human and Social Dimensions of Climate Change, and Cultural Perspectives on Sustainability. Chhetri, N. B., L. Hidinger, M. W. Neff, M. O Shea, A. Buttar and U. Chong. 2007. Multiple stressors on Central Arizona resources. Poster presented at the Symposium on Sustainable Water, Unlimited Growth, and Quality of Life: Can We Have it All?, Tucson, AZ. August 27 - September 1, 2007. Chhetri, N. B., L. Hidinger, M. W. Neff, M. O Shea, A. Buttar and U. Chong. 2007. Multiple stressors on Central Arizona water resources. University of Maryland, College Park, MD. Poster presented October 22-23, 2007 at the Climate Information: Responding to User Needs, College Park, MD. Chhetri, N. B., M. W. Neff, L. Hidinger and D. Sarewitz. 2006. Sensitivity analysis: Role of human induced stressors in increasing the vulnerability of water resources in Phoenix meteropolitan region. Poster presented at the 6-11 August 2006 91st Annual Meeting of the Ecological Society of America, Memphis, TN. Chhetri, N. B., M. W. Neff, L. Hidinger and D. Sarewitz. 2006. Sensitivity analysis: Role of human-induced stressors in increasing the vulnerability of water resources in Phoenix metropolitan region. Poster presented at the 6-11 August 2006 91st Annual Meeting of the Ecological Society of America, Memphis, TN. Neff, M. W., N. B. Chhetri, L. Hidinger and D. Sarewitz. 2006. A preliminary methodology for analysis of ecosystem sensitivity to climate and other drivers of change. Poster presented at the 6-11 August 2006 91st Annual Meeting of the Ecological Society of America, Memphis, TN. Shrestha, M., N. B. Chhetri and P. Chaudhary. 2014. Long-term changes in livestock management and mountain agroecology in the Upper Gondaki River Basin. Presentation at the Mountain Observatories - A Global Fair and Workshop on Long-Term Observing Systems of Mountain Social-Ecological Systems, 16-19 July 2014, University of Nevada-Reno. Chhetri, N. B. 2008. Consequences of climate change: Dealing with uncertainty. Presented at the Tempe Library as an outreach to general public of the valley. Chhetri, N. B. and U. Chong. 2008. Soft-path solutions under uncertainty: Multiple stressor analysis of water resources in the Lower Colorado River Basin. Paper presented April 18, 2008 at the Annual Meeting of the Association of American Geographers, Boston, MA. Chhetri, N. B. 2007. Decision making under uncertainty: Ranking of multiple stressors on Central Arizona water resources. Paper presented April 18, 2007 at the Annual Meeting of the Association of American Geographers, San Francisco, CA. Chhetri, N. B., L. Hidinger, M. W. Neff, M. O Shea, A. Buttar and U. Chong. 2007. Multiple realities: Stressor analysis of water resources in Central Arizona. Paper presented at the April 17-21, 2007 Annual Meeting of the Association of American Geographers, San Francisco, CA. Chhetri, N. B., L. Hidinger, M. W. Neff, M. O Shea, A. Buttar and U. Chong. 2007. Multiple realities: Stressor analysiss of water resources in Central Arizona. Institute of Development Studies, University of Sussex, UK. Paper presented at the September 18-20, 2007 Conference on Connecting Science, Society and Development, University of Sussex, UK. Chhetri, N. B., L. Hidinger, M. W. Neff, M. O Shea, A. Buttar and U. Chong. 2007. Multiple stressors on Central Arizona water resources. Paper presented February 2-3, 2007 at the Annual Meeting of the Science Policy Assessment and Research on Climate, Tempe, AZ.